It’s Time You Jump on the Argan Oil Train (If You Haven’t Already)! The cosmetic world has been dipped in the “liquid gold” also known as argan oil. The antioxidant-rich oil has begun to take over the shelves of beauty supply stores, drug stores and online retailers like Amazon. With argan oil’s revitalizing and hydrating properties, it’s no wonder this ingredient has skyrocketed in popularity in many hair, skin, and nail products. If you haven’t jumped on the argan train already, now is the time to add it to your beauty routine. 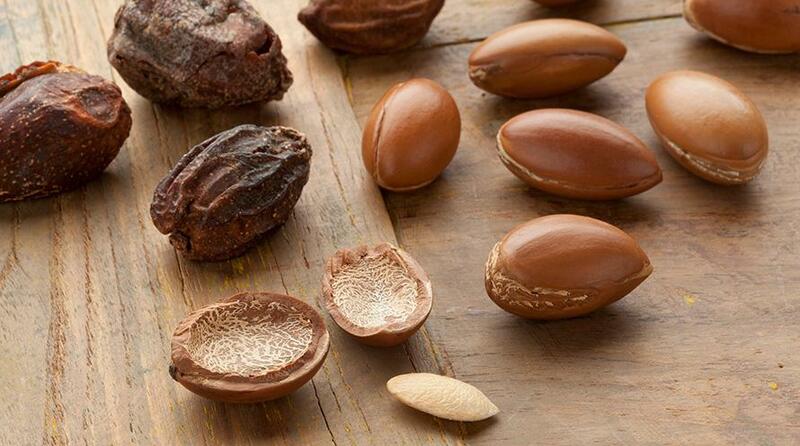 Argan oil is a natural ingredient that is extracted by pressing slightly roasted kernels of the argan tree fruit. The argan tree, scientifically known as Argania Spinosa, is a tree native to south-western Morocco. The oil derived from the argan fruit contains compounds that have promising antiviral and antioxidant properties. Additionally, the residue left over after pressing the kernels is rich in valuable proteins, which can contribute to a number of benefits for your hair, skin, nails, and health. How Is Argan Oil Made? Because of the labor intensive process to extract argan oil, the powerful ingredient comes at a price. For a single person, only 2-2.5 liters of oil are obtained from 100 kg of dry fruit and it takes up to 58 hours of hard work. However, to produce large quantities of argan oil for cosmetic purposes without compromising the quality, women’s cooperatives have been started in south-western Morocco. These cooperatives prepare argan oil by cold pressing argan kernels. Using this technology, 4-6 liters of oil can be obtained from 100 kg of dry fruit after 13 hours of work by a single person. What Can Argan Oil Do For You? In cosmetic products, argan oil brings hydration back to the skin, helps rid acne, makes hair shine, treats brittle nails and softens cuticles. Argan oil is jam packed with fatty acids, vitamins, and carotenes that support healthy skin by reducing flaky skin and adding sheen and strength to hair fiber. Because it is filled with antioxidants, argan oil is ideal for those with oily skin because it won’t clog pores and will help balance out the skin’s natural oils, reducing acne and breakouts. Not only does argan oil hydrate the skin and help clear acne, it also has anti-aging properties that prevent oxidative damage from carcinogens, pollution, and harmful UV radiation. Aside from being a beneficial component of cosmetic products, argan oil has also been proven to have cardioprotective properties as well as chemoprotective properties. Rich in Vitamin A, Vitamin E, and unsaturated fatty acids containing omega 3 and omega 6 fatty acids, cooking with argan oil is a heart-healthy alternative to fattier oils and butter (just make sure it's food grade). Argan oil has many active ingredients such as, carotenes, sterols and phenolic antioxidants which have exhibited anti-proliferative activity meaning it can be used as a natural remedy to delay the onset of cancer. Whether you’re on the hunt for new hair, skin, or nail products or simply looking for a way to incorporate healthier choices into your lifestyle, you can trust argan oil as a powerhouse ingredient in your cosmetic products or diet and reap its many benefits. Therapeutic potential of argan oil: a review. Authors Hanae El Monfalouti, Dom Guillaume, Clément Denhez, Zoubida Charrouf. 4 November 2010. I love pure and natural ingredients.